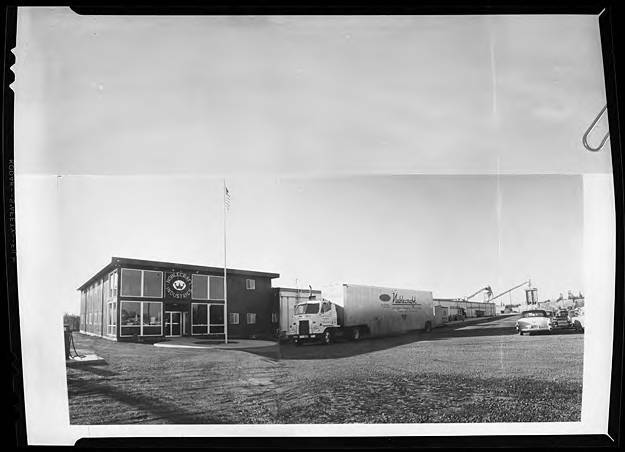 Black and white image of a square, two-story building with a sign reading 'Noblecraft Industries' on the front. A large semi is parked nearby. The trailer of the truck reads in part, 'Noblecraft. Kitchen cabinets -- Fixtures. Hillsboro, Oregon.' The factory stretches out away from the first building. The upper portion of the image has been obscured by a piece of paper, held on by a paperclip. This images was part of the Herbert McMullen bequest. McMullen was a local photographer who also collected other images of daily life in the area.